Sixty-four years ago, the United States became the first country in the world to recognize the State of Israel–the realization of a modern day state in the historic homeland of the Jewish People. Since that momentous day, the special bond of friendship between the United States and Israel has grown stronger. Ours is a unique relationship founded on an unbreakable commitment to Israel’s security, and anchored by our common interests and deeply held values. These values continue to enlighten and guide our efforts as we work with Israel, as well as with others in the region, to confront shared challenges and to achieve a just and comprehensive peace based on a two-state solution that will usher in a future of peace, security, and dignity for the people of Israel and its neighbors. Today, as Israelis celebrate their 64th Independence Day and their remarkable achievements over the past six decades, it gives me great pleasure to extend my best wishes, and the best wishes of the American people, to President Peres, Prime Minister Netanyahu, and the people of Israel. The reality of Israel after 64 years of independence is “much more than the vision we once dreamed,” Peres tells the Diaspora. 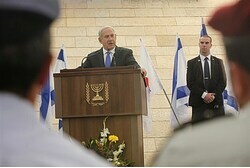 The reality of Israel after 64 years of independence is “much more than the vision we once dreamed,” President Shimon Peres told the Diaspora in a special message Wednesday..
Yom Ha’atzmaut is not only a day of celebration but also one to reflect and realize the reality we have built is much more than the vision we once dreamed,” he said. The President told Jews outside the Land of Israel that the “unyielding spirit which defines the Jewish people” drove Israel’s achievements since its reestablishment as a state in 1948. “We returned to our homeland, rich in history, yet scarce in land, meager in natural resources. We had not choice but to invest in our greatest asset – our people. And we did, together with you…. “We have built an extraordinary country, due to our extraordinary people. Today, we can proudly look upon our thriving economy, innovation serves as Israel’s heartbeat and creativity runs through our veins. Yom HaAtzmaut begins Wednesday evening with the conclusions of ceremonies in observance of Memorial Day for Fall Soldiers and terror victims. He praised what he said is the ”young generation’s commitment to our state, [which] is essential as our shared tomorrow will be defined by innovation. As partners of our nation, your ability to secure a future defined by scientific development and discoveries is vital to our shared mission. Israel’s Independence Day is a time for us to consider what makes Israel truly unique. Prime Minister Binyamin Netanyahu’s greeting in honor of Israel’s 64th Independence Day: We are unique in having such passionate friends. 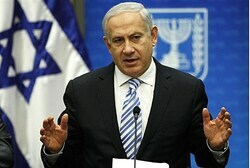 Prime Minister Binyamin Netanyahu released a special greeting on Wednesday, in honor of Israel’s 64th Independence Day. Israel is unique in restoring sovereignty, and the capacity for self-defense, to a people who had been stateless and powerless for 2,000 years. Israel is unique in ingathering to an ancestral homeland an exiled people who had been scattered around the globe. Israel is unique in having become a global technological power despite the fact that we face threats faced by no other nation on earth. Israel is unique in the Middle East for having a vibrant, liberal democracy where women are equal, minorities are free and where all are subject to the rule of law. But Israel is unique in one other important way: we are unique in having such passionate friends, Jews and non-Jews alike, for whom the well-being, security and future of our country are so important. This passionate support, along with Israel’s strong army, free economy and dynamic society, is the pillar of our national strength. And this Independence Day, I want to thank the tens of millions of friends of Israel throughout the world for their unwavering support for the one and only Jewish state. Remembrance Day for the Fallen Soldiers and Victims of Terror has ended, and Independence Day has begun. Remembrance Day for the Fallen Soldiers and Victims of Terror has ended, and Independence Day has begun, with fireworks displays going off countrywide. 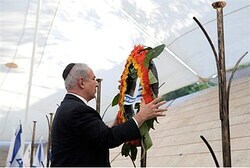 The celebration of Israel’s 64th birthday began with the traditional ceremony at Har Herzl in Jerusalem. The main speaker at the ceremony was Knesset Speaker MK Reuven Rivlin. Rivlin’s speech began with a mention of the external threats Israel faces but centered on what he said was an internal enemy which threatens Israel’s future – an enemy which he identified as “the extremists” and zealotry on all sides of the political and social spectrum. 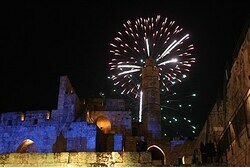 A large fireworks display beginning at 11:30 p.m. will end Wednesday evening’s Yom Ha’atzmaut festivities in Jerusalem. A large fireworks display beginning at 11:30 p.m. will end Wednesday evening’s Yom Ha’atzmaut festivities in Jerusalem’s Independence Park. Music, singing and dancing will be the main activities in the capital after Israel marks the end of memorial Day for Fallen Soldiers and Terror victims at 7:45 p.m.and begins to celebrate 64 years of an independent State of Israel for the first time in almost 2,000 years. Music popular in the religious-Zionist community will be featured at the HaMashbir stage, at King George Street in downtown Jerusalem. Bnei Akiva and the Ezra movement will dance, and the Pirchei Yerushalayim Band will appear. Bands will perform at Kikar HaHatulot, and music oriented for the younger generation will take place at the pedestrian mall at Hillel Street, next to Ben Yehuda Street. Student associations helped program the activities. Opposite the Old City Walls at Mamilla, students have organized DJ entertainment, with entrance by paid tickets. Israeli folk dancing and a songfest will be featured at the stage at Safra Square-City Hall from 10:30 p.m. until 3:30 a.m. The Day of Remembrance for slain IDF soldiers will be followed by Independence Day. A list of events for those who wish to celebrate. The Day of Remembrance for slain IDF soldiers will begin Tuesday evening and be followed by Israel’s 64th Independence Day. This list of events was compiled by Anglo-List.Com. These are not Torah-oriented events. 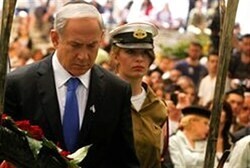 Main Event, Rabin Square, 9:00 p.m. – “Only in Israel” with the participation of military bands. Clips from different periods in Israel’s history will be screened on giant screens and fireworks will paint the sky. With: Momi Levy, Miri Aloni, Shula Chen, and dozens of dancers, Tel Aviv youth and more. The evening will close with a performance by “Quartet” – with Shem Tov Levy, Alon Olearchik, Shlomo Yidov and Efraim Shamir. Atzmadoodes – Children’s Independence Day events at the Performing Arts Center at 8:30 p.m. – Roni Superstar, Tel Aviv Youth Band, the entertainment show” Katzefet VeToot ,” fire dances, juggling clowns, aerial acrobatics performances and fireworks. Folk Dancing – Plaza Performing Arts Center, 11:00 p.m – dancing into the night with the best; Sarah Aviv and Gadi Biton combining instrumental and vocal performance and Tel Aviv University Dance troupe. Park Davidoff, Jaffa, 8:30 p.m. – Michelle Cohen Music School program, Alon de Loco with the LoCo Land show accompanied by musicians and dancers, Woody G, Yaron Ramati, local bands and more. The Even Yerushalmit band, Adir Getz, Yaniv Barmeli and Itay Moyal, Subliminal and Momi Levi, Yossi Azulai, Keren Peles. Hosted by Elad Amedi. Stage at the Hillel Pedestrian Street – Street Party for the Young. Israeli Rock at the Square: a tribute to the founders if Israeli Rock since the days of the state’s establishment: Arik Einstein, Shalom Hanoch, Matti Caspi, Shlomo Artzi, Gidi Gov, Danny Sanderson and more. Dancing Independence at the Safra Square stage: from 11:30 p.m – 3:30 a.m.
A mass dancing event, Israeli and other folk dances, with leading dance guides: Avner Naim, Haim Tzemach, Boaz Cohen, Mimi Cogan, Gidi Eiko. Hershonson Stage. : Margalit Tzanani, Benny Elbaz , Gabi and Micky Nes, Shlomit Bouhnik, Moran Kriti, Tamir Lidanil, Nati Chen and “The Independence Ride” – a 15 km. bicycle ride on Thursday morning at 9:00 from Sportec city. For information and registration: 08-9392239. 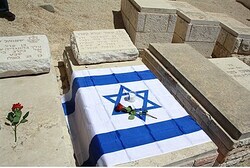 Kikar Ha’atzmaut: Danny Sanderson, Moshik Afia. “It’s 64 years of Israeli independence. 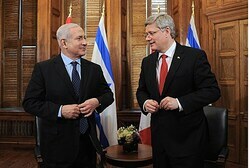 As Zionism renews itself, so does technology,” says the World Zionist Organization. The World Zionist Organization’s Department for Activities in Israel & Countering Antisemitism is offering a new service which allows users to send postcards with Israeli flags and other pro-Israel images via the internet. 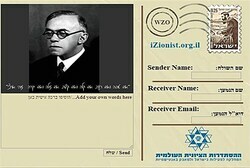 The website allows a user to select and email postcards with images of Israeli flags, nature scenes and Zionist leaders such as Zev Jabotinsky, Theodor Herzl, Menachem Begin, and David Ben Gurion. Eitan Ori Behar, director of the WZO Communications Center said this year’s campaign is based on last year’s Fly Our Flag project. In 2011, the WZO mailed out thousands of Israeli flags with car windows holders and sun shade screens with Israeli symbols. Anyone in the world had the ability to order a free flag on the WZO’s iZionist website. To send a flag, visit http://flags.org.il/view/?lang=en. Hamas would view any future agreement between the Palestinian Authority and Israel not as a permanent peace treaty but rather as a truce, a senior Hamas official told a Jewish newspaper. Mousa Abu Marzook, the deputy director of Hamas’ political bureau, told the Forward newspaper in an interview published online Thursday night that even if a permanent peace agreement were negotiated by the Palestinian Authority, Hamas would not be obligated to recognize it as anything more than a hudna, an Arabic word for a temporary truce.